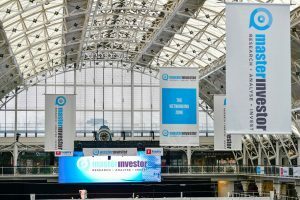 On Saturday 6th April 2019, Conkers3‘s Peter Higgins had the huge pleasure of working with the Master Investor Show under the fantastic stewardship of their Chief Commercial Officer Amanda Taylor. 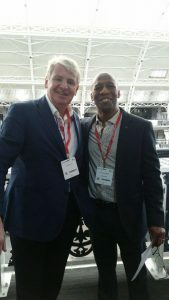 As well as compering on the Rising Stars Stage, Peter conducted 4 interviews with thought leaders and innovators; including that of Jim Mellon, the UK’s self made billionaire investor, entrepreneur, philanthropist, author and owner of the Master Investor Show. 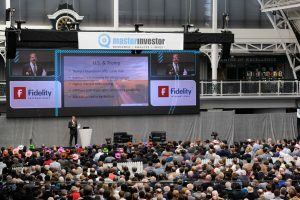 With 5000 delegates, 100 companies/exhibitors and 50 high quality speakers, the day reached its pinnacle with Jim Mellon, delivering from the main stage to a packed audience, a riveting, insightful view on markets, politics, macro-economics, risks, investments themes and investment opportunities. A number of people told Peter that it was the best Master Investor Show they’d ever attended! 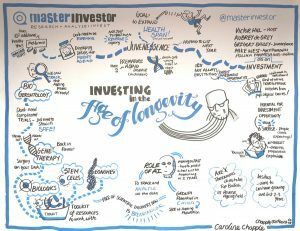 Here is a visual summary of the five main stage presentations, brilliantly captured by the artwork, graphics and illustrations of Caroline Chapple . The QuotedData Panel discussion: Investment strategies – what works? Ed Marten, CEO of QuotedData (Host), Nick Brind, Fund Manager of Polar Capital Global Financials Trust, Chris Clothier Director of CG Asset Management and Dan Whitestone, Fund Manager of Blackrock’s Throgmorton Investment Trust. 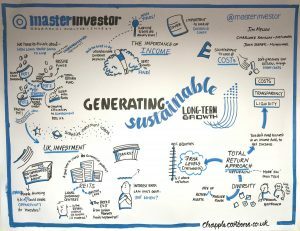 The Jim Mellon and NetWealth Panel discussion: Generating sustainable long-term income. Jim Mellon (Moderator), Charlotte Ransom, Founder & CEO of Netwealth Investments, John Stepek, Executive Editor of Moneyweek . 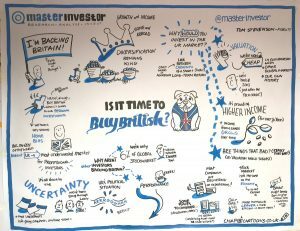 The Fidelity International presentation: Is it time to buy British? Tom Stevenson, Investment Director for Personal Investing at Fidelity International. 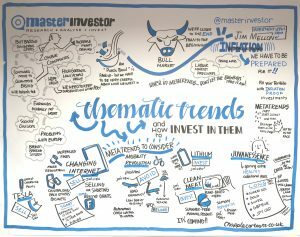 Jim Mellon presentation: Thematic trends and how to invest in them. Victor Hill of Master Investor (Moderator), Dr Aubrey de Grey of SENS Research Foundation, Dr Gregory Bailey, CEO of Juvenescence, Polina Mamoshina, Senior Researcher, Insilico Medicine and Mike West, CEO of AgeX Therapeutics. All of the above five illustrations are copyrighted to Caroline Chapple and have been published here after she kindly gave her permission. 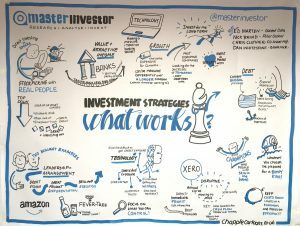 Caroline completed the illustrations whilst listening to the five presentations on the main stage at the Master Investor Show. As you can see she is an amazing graphic recorder, illustrator and cartoonist. Please stay tuned as Conkers3‘s Peter Higgins was very fortunate to have been granted interviews with Jim Mellon, Tom Stevenson of Fidelity International, Dr Aubrey de Grey of SENS Research Foundation and Charlotte Ransom of Netwealth. The videos of all of those interviews will published within the next month or so. 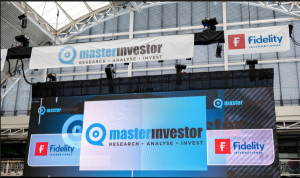 NEWS FLASH: The date for the Master Investor Show 2020 will be on 28th March. Book your free early bird ticket now.